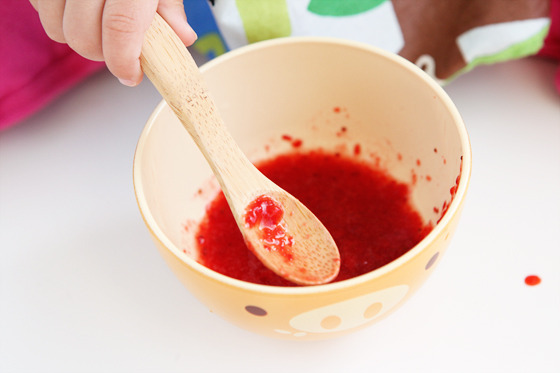 If you're looking for an alternative to plastic utensils and tableware for your kids, try Bambu. The Bambu KIDS collection is made with certified organic bamboo with absolutely no bleaches or dyes. Avery seems to like the length and size of her Bambu utensils. And we don't know if it's just our imagination, but food seems to stick a little better to her Bambu spoon and fork, which is important in her current stage of learning to feed herself. She manages to get quite a bit in her mouth now, but not without spillage! Thank goodness we have the wonderful Mimi the Sardine messy baby bib there to catch Avery's strawberry mess! You can read about Bambu's philosophy on renewable materials and more, here.